Veteran public radio and print news reporter Scott Gurian loves to travel, visiting places where few people have the opportunity or courage to go. Gurian is perhaps best known as part of a Peabody Award-winning news team covering New Jersey's recovery from Superstorm Sandy and the state's subsequent misallocation of storm resiliency money. His work has led him to Cuba, Haiti, and Mexico, and his penchant for personal travel has drawn him to more far-flung destinations, including Cambodia. But even for Gurian, the 2016 Mongol Rally was the adventure of a lifetime-and his two TASCAM DR-40 handheld four-track recorders accompanied him for the entire 18,000 mile roundtrip. The Mongol Rally comprises hundreds of teams driving tiny vehicles-engine size is limited to no more than 1.2 liters-from a point a few hours south of London all the way to Ulan Ude, Russia, just across the border from Mongolia. Each team chooses its route, and there are no winners or losers. The goal is to make it to the finish line, see a fascinating part of the world, and raise money for a variety of good causes. Gurian's new podcast, Far From Home (https://farfromhomepodcast.org) draws on more than 65 hours of audio recordings to transport listeners along with him and his brother on their amazing odyssey across Europe and Central Asia. The Gurian brothers, aka Team Donundestan, traveled in tandem with friends Jane Box and Rosi Moore-Fiander (Team Sugar+Spice), choosing an 11,000-mile route through parts of the U.K., France, Belgium, Luxembourg, Germany, Austria, Hungary, Romania, and Bulgaria, then across Turkey and Iran, and up through Turkmenistan, Uzbekistan, Tajikistan, Kyrgyzstan, Kazakhstan, Russia, and Mongolia. After completing the seven-week journey, from July to September 2016, Drew flew home but Scott turned around and drove another 7,000 miles across Siberia, Ukraine, Poland, Germany, and The Netherlands, with a side trip to Italy and the Vatican. His TASCAM DR-40 recorded it all. 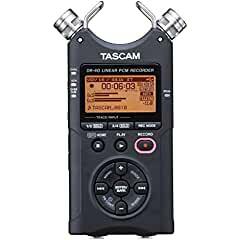 "The TASCAM DR-40 is small, it's handheld, and it has built-in mics, not a separate mic," begins Gurian. "I can get professional quality results with it but it doesn't look like a pro setup of the sort I normally use in reporting, with a bulky recorder and a shotgun mic with a Zeppelin windscreen. That was an advantage because portability was important, and given the political climate of Central Asia, there were many situations where I didn't want to identify myself as a reporter. This was the story of our own trip and adventures and the people we met along the way. If I were to be confronted and questioned, I had stories ready. I even had a separate flash card with music that I put inside the DR-40 so I could play it back and say, 'It happens to have a microphone but I'm just using it for listening.'" Although recording without a shotgun mic limited Gurian's ability to record sound from a distance, he was able to capture quite a lot with the DR-40. "Other radio people who use the DR-40 recommended just using the built-in mics," he notes. "A shotgun mic would have been super helpful to get sound a few feet away and to have the wind protection of the zeppelin windscreen, but I was very pleasantly surprised with the results I got from the DR-40. It worked really well." Many of Gurian's recordings captured conversations among the travelers as they planned the route, as well as the sounds of their adventures. He also recorded sounds you'll only hear by going where he did or by listening to his Far From Home podcast. "One of the most interesting places we went was Tuva, in Southern Russia along the Mongolian border," he recalls. "Tuvan throat singing is amazing, and it's strange. I even took some throat-singing lessons. We happened upon a rehearsal of the Tuvan National Orchestra, and they did a song just for us that had instruments made out of random items. For instance, someone was sharpening a knife, and that was an instrument. They had a big wheel where they were grinding grain, and that was an instrument with a rumbling sound. I got some beautiful recordings just walking around holding the DR-40 in my hand. The sound quality was really good." laptop in a Dropbox folder, and whenever we were in a Wi-Fi area, the laptop uploaded the files to the online Dropbox automatically. I gave the password to folks back home in case anything happened to me. I also copied everything to a thumb drive I carried with me so I had multiple backups in multiple places and also to clear my recordings off the recorder in case it was checked. I had two DR-40s because they're small enough to easily have a backup, but I didn't need it." Wind noise was an inevitable challenge, which Gurian could only partially manage with a furry "dead cat"-type windscreen. "Unfortunately I didn't have the proper TASCAM windscreen, and the elastic on the third-party windscreen kept falling off," he admits. "Now I'm getting a real TASCAM windscreen to use in the future. Of course, even with the proper windscreen, it's not going to provide the same protection as a microphone zeppelin, where you have an air barrier around the microphone. But it helps." Gurian stocked up on regular batteries, rather than rechargeables, and since he rarely recorded for extended periods, battery life wasn't a problem. Gurian insists that many of the places he visited were less dangerous than most Westerners expect. In Iran, the two teams used a regular tour guide, not a government minder, and Gurian found the Persian people to be the friendliest and most hospitable he has ever met. Entering Turkey six days after an attempted coup was no problem. His return trip included Chernobyl-"the most curious, strangest place I've ever been to," he declares-and the Ukraine, albeit not the war-torn eastern areas. Neither proved an issue. However, Team Donundestan did have to deal with many border guards, including in such authoritarian countries as Turkmenistan. Staying as discreet as possible, Gurian recorded conversations with the border guards and with police who pulled them over ("they wanted to extract bribes from us, claiming we were speeding, which we clearly weren't," he recalls), using his iPhone and TASCAM's now-discontinued PCM Recorder app. He also used the phone app for certain situations where he wanted to walk up and record unnoticed. Through all of his travels, from the blazing heat of Turkmenistan's Karakum desert in a car with no air conditioning to a chilly night camping in Tajikistan at three miles in altitude, Gurian never had a problem with his TASCAM DR-40. As of this writing, he is working on the 15th half-hour episode of Far From Home, with much more to come. "The power of good audio is that it transports you to places," maintains Gurian. "It's like movies for your ears, and people create the images in their mind. I wanted get out in the field and bring the world back to people so they can listen to it wherever they are. TASCAM's DR-40 did a great job for me all the way from London to Mongolia and back."